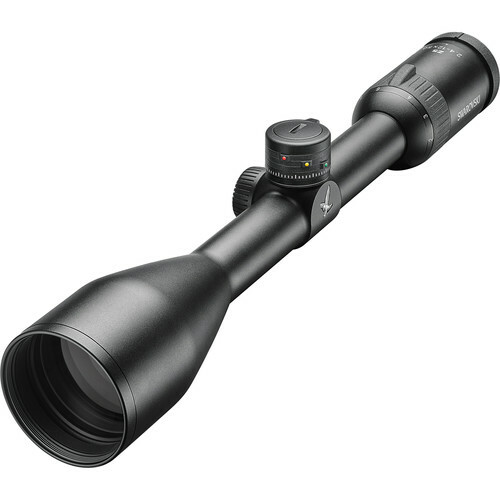 Developed specifically to meet the needs of long-distance shooters, the Swarovski Z5 BT 2.4-12x50 Riflescope comes outfitted with their proprietary elevation Ballistic Turret (BT) that provides a fast way to adjust your zero for up to four different distances with the ability to easily reset to absolute zero. Speaking to the fast-reaction time that is the hallmark of the BT turret, it is uncapped for easy and instant access when changing shooting distances in the field. Complementing the turret system is a wide 90 MOA elevation adjustment range at 1/4 MOA/click that gives you plenty of rotational room for extreme distance shooting, with the precision to get on target at closer range. Furthering its user-friendly design, Swarovski simplified the entire scope and stripped away anything that wasn't a necessity to keep its use simple and the profile and weight to a minimum. This starts with a basic duplex crosshair reticle that presents an uncluttered view that won't distract you, and ergonomically placed zoom collar and dioptric correction adjustment. A 1" maintube makes it compatible with a wide variety of rings and mounts without adding excessive bulk. The housing is made of a lightweight and durable aluminum alloy that is treated with a scratch-resistant matte-black anodized finish. O-rings seal in the inert nitrogen gas that fills the scope, making it waterproof, submersible, and resistant to internal fogging in extreme conditions. Stripped to the basics, optimized for long distance, and designed for fast range transitions, the Z5 BT is an ideal choice for no-nonsense shooters.